In a typical year, you have about 60 meetings to choose from. Most are Subgroup meetings dedicated to a variety of special interests. Most are held throughout the state of NH. Some have been held in nearby states as well. Typically, the Guild has four major meetings per year. These may be single or multi-presenter demonstrations or symposiums. 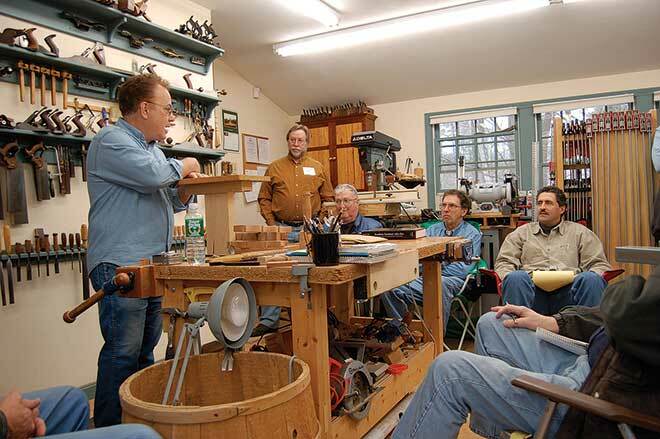 Topics have included everything from furniture design to “how-to” presentations on dovetails, compound laminations, sharpening, windsor chair making and more. Officers are elected at our annual meeting in the fall where there is also an auction to benefit the Guild Scholarship Fund. These groups plan their own meetings and other activities, typically meeting five or six times per year at shops and other facilities around the state. There are nine active subgroups as of Jan. 2014. See more about subgroups here. As the Guild has grown and attendance at Guild meetings increased, we found it more and more difficult to meet in member shops. Many missed the opportunity of visiting other shops and the more intimate setting. To fill this void, once or twice per year, we organize a day of multiple small meetings each with a different topic.